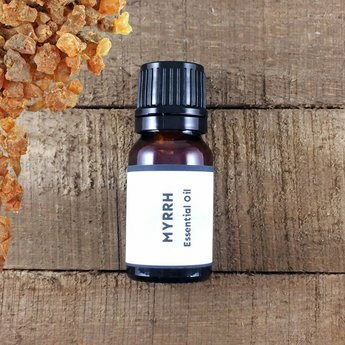 Myrrh (Commiphora myrrha) essential oil has a rich, warm, sweet, resinous bouquet with a delicate spicy-aromatic undertone. A resin pried by our ancient ancestors for its healing and spiritual properties. Direct Palm / Nasal Inhaler: Place a drop of oil in the palm of your hand, gently rub the hands together, cup your hands around your nose and take a deep breath in through the nose to awaken the mind. You can also add several drops to nasal inhaler and breathe in throughout the day. You can repeat multiple times though out the day. Apply 1 drop to infected gums. Egyptians believed this fragrant odor pleased the gods so it was frequently burned during ceremonies. The Greeks used the resin on wounded solders to promote healing. Cautions: Myrrh is considered non-toxic and non-irritant.